The Federal Reserve’s stated goal is to create modest inflation. Unfortunately they don’t grasp the difference between speculative inflation and organic inflation. The Fed’s official goals are to stabilise prices and maintain employment, and its de facto policy to achieve these lofty, high-minded goals is to divert huge sums of the national income to the insolvent banking sector. In a paper from which he earned the sobriquet “Helicopter Ben,” Chairman Bernanke provided a thought experiment to demonstrate that any deflation could be defeated: most economists would agree that a large enough helicopter drop [of newly created money] must raise the price level…at some point the public would attempt to convert its increased real wealth into goods and services, spending that would increase aggregate demand and prices. As a result, there’s no follow-through of higher spending. Bernanke’s policies have failed to generate higher spending for a number of fundamental reasons. The distinction between housing assets and equity assets is absolutely critical, but it’s completely lost on the Fed. We can see Bernanke’s game plan in action in the most recent Fed Flow of Funds. He’s also accomplished a stupendous transfer of national income to the financial Elites in the banking sector by lowering interest rates to zero (ZIRP). Back in the low inflation 1960s, banks and savings and loans were required to pay 5.25% on all savings. Cash, in other words, generated substantial income for ordinary savers. The idea with ZIRP is to loan the banks essentially free money, which they can lend out at between 5% and 12% (or higher), generating “free” profits. 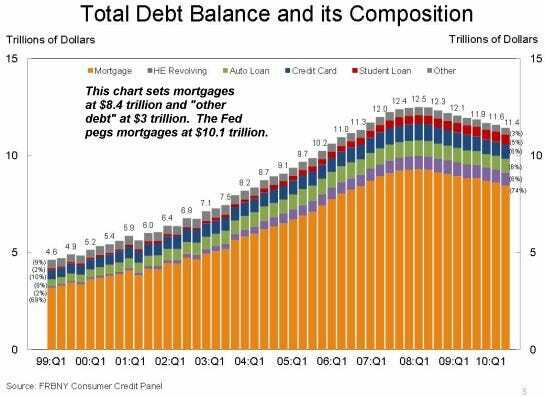 The Fed’s plan is to sluice these gigantic profits to banks so they can recapitalize their insolvent balance sheets without any direct handouts. But ZIRP is nothing but an indirect transfer of wealth from the private sector (now completely deprived of any interest income) to the banks. The Fed’s policies allow for only two ways to access this newly created “increase in real wealth” for the top 10%: sell the assets or borrow money from the banks. If people cash out their stock gains, then that would automatically push stocks lower, bollixing the game plan. The Fed’s intention is to “nudge” the populace into borrowing more money from the banks at nominally high rates of interest (anything above 0% is pure profit for the banks). Unfortunately for the Fed, those with rising assets are no longer hankering for higher debt levels, and the bottom 80% are no longer qualified to borrow. So what we have is aspeculative asset inflation which is spilling over into commodities as hot money borrowed for next to nothing seeks higher returns anywhere on the planet. Importantly, the wealth transfer that takes place during an inflation is hidden and largely unrecognised by the majority of the population. The population is unaware that the supply of money is increasing and the attendant rise in prices, ostensibly beneficial to business, initially produces [a] general state of euphoria, a false sense of well-being, in which everybody seems to prosper. Those who without inflation would have made high profits make still higher ones. Those who would have made normal profits make unusually high ones. And not only businesses which were near failure but even some which ought to fail are kept above water by the unexpected boom. There is a general excess of demand over supply–all is saleable and everybody can continue what he had been doing. Here is where we are in a nutshell. The general populace has seen its income decline as the Fed’s ZIRP policy has channeled their interest income directly into the banks, and as their wages stagnate. Yet thanks to the speculative inflation engineered by the Fed, prices are rising. In an organic inflation, wages and interest income would both be rising along with prices. So the direct result of the Fed’s policies is higher costs and the transfer of national income to the banks. The average household has seen its income and its asset base (housing) stagnate or decline. Meanwhile, the equities market, which directly “increases real wealth” in only the top 10%, has risen over 80% from the Q1 2009 low. If the bottom 80% are seeing income and assets stagnate or decline, how can you possibly get organic inflation? Answer: you can’t. And speculative inflation only benefits the top financial players, not the general populace. 1. Reinstate the policy of paying 5.25% on all savings, effectively transferring wealth back from banks to citizens. If the banks can’t manage to do so and remain solvent, then close them down and liquidiate their assets and liabilities. Others will rise to take their places. 3. Aggressively cram down underwater mortgages onto the banks, forcing them to liquidate all their bad debt. Yes, this will reveal them as insolvent, but the goal here is not to save the financial Elites’ impaired assets, it’s to reset the housing market by clearing off all the impaired debt in the system. Is this a wise or prudent policy? I don’t know. The goal here was not to assess that question, it was simply to follow up on the goal of creating inflation. If you want organic inflation, you have to divert the national income from the banks to the citizenry, and you have to reset the housing market. The Fed’s policies cannot create organic inflation, because all the Fed is doing is transferring wealth to the nation’s Elites. Their spending on luxuries and fine dining are not broadbased enough to generate organic inflation in the entire economy.